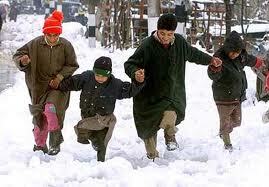 The first major snowfall in Kashmir on Thursday 30th December,2010 in Kashmir ended the two month long dry spell. All schools closed till further orders. Snow which began falling on Wednesday accumulated in sizable amounts through out the Vally. Five houses in south Kashmir were damaged due to heavy snow fall. There was no electricity many roads were closed. Authorities closed the Srinagar-Jammu National High way. Due to heavy snow fall at the Srinagar International Airport, no flight could land to take off. The schools were closed due to inadequate heating arrangements. The Kashmir University has postponed examinations till January 2nd.